As the E190-E2 new generation narrow-body jet approaches certification, Embraer announces some final results from flight tests confirming that the aircraft is better than its original specification and even more efficient than other single aisle aircraft. In fuel consumption, the E190-E2 proved to be 1,3% better than originally expected, which represents a 17,3% improvement when compared to the current generation E190, and nearly 10% better than its direct competitor. The E190-E2 also becomes the most environmentally friendly aircraft in the segment, with the lowest level of external noise and emissions. The cumulative margin to ICAO Stage IV noise limit increases from 17 to 20 EPNdB, which results in 2 EPNdB better than its direct competitor. Rodrigo Silva e Souza, Marketing VP, Embraer Commercial Aviation, said, “this means that when our first operator , Widerøe, operates its inaugural E190-E2 flight on April 24th from Bergen to Tromsø, it will be the first in-service flight of the world’s most efficient and eco-friendly narrow-body jet. 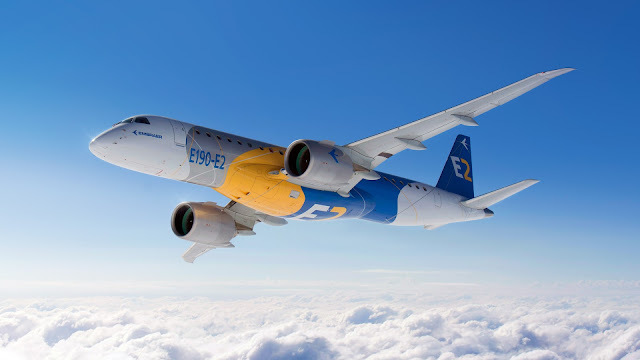 This is an immense achievement for our team and means additional value delivered to our customers.” Flight test results also confirmed the E190-E2 to be better than its original specification in takeoff performance. The aircraft’s range from airports with hot-and-high conditions, such as Denver and Mexico City, increases by 600 nm compared to current generation aircraft. Its range from airports with short runways, such as London City also increases by more than 1,000 nm allowing the aircraft to reach destinations like Moscow and the north of Africa. E190-E2 also becomes the aircraft with the longest maintenance intervals in the single aisle market with 10,000 flight hours for basic checks and no calendar limit in typical E-Jets utilization. This means additional 15 days of aircraft utilization in a period of ten years compared to current generation E-Jets. Another key program target where the E190-E2 obtained better results than initial expectations is in pilots transition training time. Pilots of Current generation E-Jets will need only 2.5 days of training and no full flight simulator to fly an E2. “Decreasing the training burden for pilots transitioning from E1 is another huge reduction in both time and cost for our operators. This coupled with the E2 family’s world leading fuel efficiency and lowest noise footprint, make the E2 the most cost effective aircraft in its segment by every measure”, explained Silva. Embraer is the world’s leading manufacturer of commercial jets with up to 150 seats. The Company has 100 customers from all over the world operating the ERJ and the E-Jet families of aircraft. For the E-Jets program alone, Embraer has logged more than 1,800 orders and 1,400 deliveries, redefining the traditional concept of regional aircraft by operating across a range of business applications.